Fuel cells are one of the most promising new forms of energy generation. The technology is clean, quiet and efficient but the hundreds of layers in a commercial-scale fuel cell stack and the number of stacks needed to generate sufficient power make it almost impossible to manually assemble them at speed. 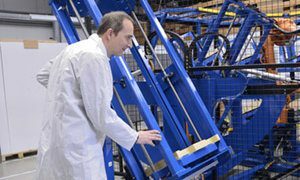 Cambridgeshire-based GB Innomech (Innomech) has designed and recently completed a novel automated manufacturing system that AFC Energy will use to assemble five stacks per day. Energy KORE systems. Each system contains 24 fuel cell cartridges generating in total around 250 kW at full power and the first system is due to be installed this year. The fuel cell stack within a cartridge is made up of multiple layers of anodes, cathodes and spacer components and assembled in sequence to form the specific channels that will carry hydrogen, air or the potassium hydroxide electrolyte during use. Hydrogen and oxygen spacers incorporate a gasket material that forms a gas-tight seal when compressed. The active surfaces of the electrodes are extremely sensitive to damage, so the plates need to be interleaved with plastic spacers to prevent them touching one another when stacked up ready for assembly. The anodes and cathodes need to be correctly placed face up or face down to ensure the right electrical connections in the final stack. Once all of the electrodes and different spacers for hydrogen, oxygen and electrolyte have been added, the stack needs to be compressed to a predetermined load to form the seals and create a gastight unit before being bolted together manually with tie rods. Although none of the individual components are particularly heavy, there are hundreds of layers and the final completed stack needs to be moved by forklift on account of its weight and bulk. The challenge for Innomech was to scale up the manufacturing process and to automate the assembly of stacks to a consistent quality, while also allowing the operator to safely manipulate the stacks and complete manual process steps at the start and end of the production cycle. The assembly system uses an ABB IRB 2600 industrial robot, with a 1.65 m arm and a 20 kg payload capacity surrounded by a racked enclosure with hoppers of fuel cell components. There are four bulk quantities of electrodes all with protective spacers between each plate: one with cathode sheets face up, a second with them face down and the same for the two anode stacks. The stacks of layers are angled in the racking so that gravity helps with alignment and registration. The fuel cell stack assembly process starts with an operator adding an end cap onto the build frame, which is angled to help with component alignment and also mounted on a rotating turntable. The robot then visits each component station in the configured order, scans down to identify the top of the stack and uses a specially-designed multi-purpose gripper to pick up components and add them sequentially to the build frame: expanding mandrels are used to pick and place spacer components, and a combination of the mandrels and vacuum cups pick up an electrode with its associated protective plastic spacer. Each electrode plate is laser marked with unique human and machine-readable codes to ensure full traceability throughout subsequent manufacturing and also to capture data on the performance of each electrode throughout its lifetime. When the robot needs to add a cathode or anode to the build frame, it picks up the electrode with the spacer below from the relevant hopper bin before travelling to a discard station to drop the plastic sheet. The robot then presents the electrode to two SensoPart smart cameras that can read 2D matrix codes and handle all of the image capture and processing without a separate vision system PC. The part code presented by the camera is used by the database PC to verify and record that the correct electrode is being added in the right orientation. When all the layers have been added to the stack, including the top end cap, , the operator can rotate the turntable through 180° to access the part assembled stack and to move a second build frame into position the robot can continue with its assembly tasks. A specially-designed intelligent servo press, capable of exerting a 1.5 ton-force compresses the stack to a controlled force and distance before the operator instructs the system to rotate the frame to a horizontal position so that tie rods can be easily inserted and secured with . The final stage of fuel cell stack assembly is to rotate the turntable to position the secured stack back in front of the robot so that it can make the necessary electrical connections between the individual cells within the stack. To achieve this, Innomech has combined the robot’s sophisticated sensor based guidance system and fast processing power with a specially designed passive spring-loaded gripper tool. The robot automatically changes its electrode and spacer tool for the gripper which picks up electrical connector clips from a tray. The robot then scans the compressed fuel cell stack to identify the correct positions and pushes the connector clips into position. The completed stack can then be rotate on the turntable back out of the robot workcell and disconnected from the build frame for testing, to have its final electrical connections added and for integration into the fuel cell cartridge housing and the rest of the system. Innomech has designed the automated manufacturing system to assemble fuel cell stacks with an agreed number of layers and interconnected anodes and cathodes but the system can also be quickly and easily reconfigured by its operator, if required, to build stacks with a larger or smaller capacities. The second phase of work, which is due to start later this year, is for the company’s automation specialists to design and develop disassembly equipment that will allow fuel cell stacks to be taken apart layer by layer at the end of their working life. The electrode materials, plates and spacers can then be separated for recovery and re-use with the catalysts and other materials regenerated and recycled.